1314 Battle of Bannockburn: Scottish troops under the command of Robert the Brucem, outnumbered four to one, inflict a crushing defeat on Edward II of England. This battle, which takes place near Stirling Castle, will be decisive in securing Scotland's independence from England 13 years later. 1340 Hundred Years War: The British fleet destroys the French at Sluys. 1348 The Order of the Garter is founded by King Edward III of England - motto 'Honi soit qui mal y pense'. 1497 The first recorded sighting of North America by a European takes place as Italian explorer John Cabot spots land, probably in present-day Canada. John Cabot (whose original name was Giovanni Caboto) lands on the eastern coast of Canada and claims the land for England. The exact location of his landing is still uncertain, but scholars believe it is probably on Cape Bonavista in Newfoundland. 1509 Henry VIII is crowned king of England, the second monarch from the House of Tudor. 1527 King Gustavus of Sweden assembles the Diet of Wester's, for the purpose of carrying through the Protestant Reformation in Sweden. 1662 A Dutch invasion of Macau is repulsed; now known as Macau Day. 1771 Birth: E. I. Du Pont, in France, chemist, scientist . 1778 David Rittenhouse observes a total solar eclipse in Philadelphia. 1783 Birth: Johann Heinrich von Thunen, economist, geographer, farmer. 1793 French Revolution: The Constitution of Year One of the Republic is approved. 1813 Birth: Henry Ward Beecher, in Litchfield, Connecticut, American clergyman and orator; The Independent. Died in 1887. 1813 Battle of Beaver Dam: British and Indian forces defeat US forces during the War of 1812. "...Laura Secord was a genuine Canadian heroine of the War of 1812 who, having overheard that the Americans were planning to ambush a small detachment of British soldiers under Lieutenant James FitzGibbon, set off on a dangerous 20-mile cross-country trek to warn him. Thus forewarned, FitzGibbon turned the tables on the Americans at the Battle of Beaver Dams, defeating and capturing an entire American regiment with his tiny force. From Laura's account to the Queen: "...I shall commence at the battle of Queenston, where I was at the time the cannon balls were flying around me in every direction. I left the place during the engagement. After the battle I returned to Queenston, and then found that my husband had been wounded; my house plundered and property destroyed. It was while the Americans had possession of the frontier, that I learned the plans of the American commander, and determined to put the British troops under Fitzgibbon in possession of them, and if possible, to save the British troops from capture, or, perhaps, total destruction. In doing so I found I should have great difficulty in getting through the American guards, which were out ten miles in the country. Determined to persevere, however, I left early in the morning, walked nineteen miles in the month of June, over a rough and difficult part of the country, when I came to a field belonging to a Mr. Decamp [DeCew], in the neighbourhood of the Beaver Dam. By this time daylight had left me. Here I found all the Indians encamped; by moonlight the scene was terrifying, and to those accustomed to such scenes, might be considered grand. Upon advancing to the Indians they all rose, and, with some yells, said "Woman," which made me tremble. I cannot express the awful feeling it gave me; but I did not lose my presence of mind. I was determined to persevere. I went up to one of the chiefs, made him understand that I had great news for Capt. Fitzgibbon, and that he must let me pass to his camp, or that he and his party would be all taken. The chief at first objected to let me pass, but finally consented, after some hesitation, to go with me and accompany me to Fitzgibbon's station, which was at the Beaver Dam, where I had an interview with him. I then told him what I had come for, and what I had heard: that the Americans intended to make an attack upon the troops under his command, and would, from their superior numbers, capture them all. Benefiting by this information Capt. Fitzgibbon formed his plan accordingly, and captured about five hundred American infantry, about fifty mounted dragoons, and a fieldpiece or two was taken from the enemy. I returned home next day..."
1821 Battle of Carabobo: Independentists defeat Spanish royalists outside of Caracas, sealing Venezuela's independence from Spain. The independentist troops, which include horsemen from the Venezuelan plains (known as 'llaneros') and English and Irish soldiers from the British Legion, are led by Simon 'The Liberator' Bolivar, one of history's most outstanding military and political leaders. 1842 Birth: Ambrose Bierce, writer, satirist; Devil's Dictionary. 1859 Battle of Solferino: In Lombardy, Napoleon III defeats the Austrians. Note: Swiss businessman Jean Henri Dunant, traveling through Italy, will witness the suffering on this battlefield after the Battle of Solferino. His horror will lead him to found the International Red Cross in 1864. 1861 US Civil War: Tennessee becomes the eleventh and last state to secede from the United States. 1866 Seven Weeks War: The Austrians score a notable victory over the Italians in the second Battle of Custoza. 1898 Spanish-American War: American troops drive Spanish forces from La Guasimas, Cuba. "...With the Spanish-American War the United States greatly increased its international power. US opponents of the war, including Mark Twain and Andrew Carnegie, organised themselves into the American Anti-Imperialist League. The Treaty of Paris (1898), ended the Spanish-American war, giving the United States possession of the Philippines, Puerto Rico, Guam, and Cuba in exchange for $20 million..."
1908 Death: Grover Cleveland, 22nd and 24th president of the United States, at the age of 71 in Princeton, New Jersey. "...Cleveland chose to not run again for the Democratic presidential nomination in 1896, but was disappointed when his party nominated William Jennings Bryan on a Silver Platform. Cleveland supported a late-coming Gold Standard ticket that managed only 100,000 votes in the general election. After leaving the White House, he lived in retirement in Princeton, New Jersey. For a time he was a trustee of Princeton University, bringing him in contact with Woodrow Wilson, the only other Democrat elected between 1860 and 1932. In 1904, some conservative pro-business Democrats talked of renominating Cleveland to oppose progressive Republican President Theodore Roosevelt. However, Cleveland declined to reenter politics, and died in 1908 from a heart attack." 1910 The Japanese army invades Korea. 1915 Birth: Sir Fred Hoyle, cosmologist; will propose the steady-state universe theory. 1915 More than 800 people perish when the excursion steamer Eastland capsizes at Chicago's Clark Street dock. 1916 WW1: Joffre launches his long-planned Allied offensive with a week-long artillery bombardment; the first Battle of the Somme begins. It will last for five months and the death toll of more than 1 million will buy an allied advance of only 125 square miles. 1917 WW1: The American Expeditionary Force (AEF) and the First Division, an amalgam of existing regular army units, under Major. General John J. Pershing arrive in France. Pershing's calls for a million-man army overseas by May 1918. 1917 Death: Orville J. Nave, US Armed Services chaplain and compiler of the popular Nave's Topical Bible. 1920 The Chuvash Autonomous Region is formed in the RSFSR (Russian Socialist Federal Soviet Republic). 1922 Death: German Foreign Minister Dr. Walter Rathenau, 55, murdered by anti-Semitic German nationalists in Berlin. 1924 Weimar: Dr. Karl Haushofer (above) visits Hess and Hitler in Landsberg prison. Prison records show that between June 24 and November 12 he visited them eight times, always on Wednesdays and staying the whole morning and afternoon. "Karl Haushofer, German geographer, theorist of Nazi geopolitics, including the doctrines that the state is a living organism and that race and territory are linked. After a successful military career he became (1921) professor of geography at Munich. Among his students was Rudolf Hess, who introduced Haushofer to Hitler. Haushofer's influence on Hitler is evident in Mein Kampf, and he remained one of Hitler's closest advisers on foreign affairs. In 1946, Haushofer and his wife committed suicide by taking poison. Haushofer was influenced by Alfred Kjellen, the Swedish creator of the term geopolitics; Frederick Ratzell and his organismic theories; and Sir Halford John Mackinder, who put forth the heartland concept. His writings include Geopolitik des Pazifischen Ozeans (1925), Bausteine zur Geopolitik (1928), and Weltpolitik von heute (1934). Haushofer also edited the periodical Zeitschrift für Geopolitik." 1927 The Legion of the Archangel Michael is founded in Romania. 1932 Birth: David McTaggart; will confound Greenpeace. 1933 The German Congress of Christian Trade Unions is dissolved. 1933 Resistance: The Association of Jehovah's Witnesses in Germany states that they have no quarrel with the Nazi regime and its principles except for swearing an oath of loyalty to Hitler. Note: This qualification will be enough for the Nazi's to justify systematically eliminating virtually all Witnesses over the next 12 odd years. 1935 Holocaust: More than 10,000 members of the Hitler Youth take a formal oath "to eternally hate the Jews." 1935 Birth: Pete Hamill, NY Post journalist, syndicated columnist, editor. 1940 TV cameras are used for the first time in a political convention as the Republicans convene in Philadelphia, Pennsylvania. 1940 WW2: An armistice is concluded between France and Italy. 1940 The Secret Diary of Anti-Hitler Conspirator Ulrich von Hassel: I found Y who had turned very critical after the attack on Belgium and Holland, completely shaken by the vast military successes. He did not express a political opinion. On the other hand, Z was obviously inclined to believe from the religious point of view that a man who could bring off such successes must have God on his side. I am convinced that Hitler and, in a quite different way, Goering, have really played a great part in the successes. Although the achievements of the military leaders, the qualities that the new army has inherited from the old, and the contributions by such men as Gessler, Seeckt, Beck and Fritsch are being shamelessly suppressed. No one can deny the magnitude of Hitler's successes. But that does not alter the real character of his acts and the dreadful dangers to which all higher values are now exposed. A demonic Spartacus can have only a destructive effect if he is not counteracted in time. The tragic burden of not being able to rejoice at the successes is enough to drive one to despair. And among the people, stupendous obtuse indifference holds sway, as a result of their having been subjected for seven years to a barrage of loudspeaker orations. 1940 WW2: Japan formally requests that Britain close the Burma Road. 1941 Diary of Leon Gladun: "Battles at Kowno, Wilno, Kobrin and Grodno. The Germans have lost 380,000 men, the Soviets 372,000--752,000 casualties in total. The USSR has negotiated a mutual assistance pact with England. We're starting to believe that we too may yet fight!" 1941 WW2: 2,000 Polish prisoners are marched out of Wilejka prison by several hundred collaborators and the NKVD. Prisoners are shot/bayoneted by their escorts and attacked by German planes. Some 547 prisoners are missing five days later. 1941 WW2: The Germans advance into Russia and take Vilna, Brest-Litovsk and Kaunas. 1945 WW2: British bombers destroy the Bridge Over the River Kwai (above, today). 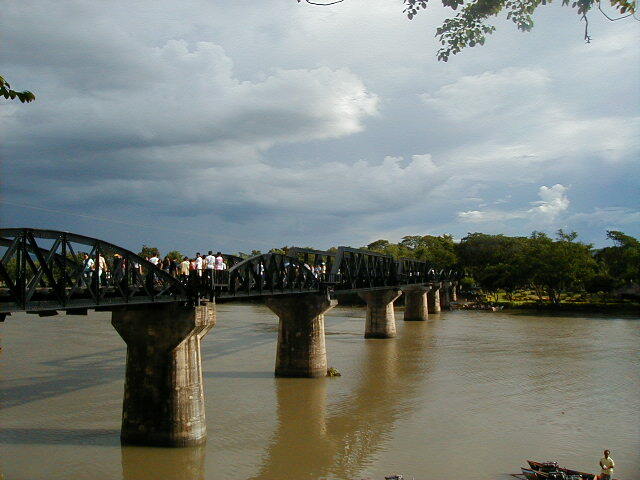 Thousands of British and Allied prisoners of war, forced into slave labor by their Japanese captors, had built the bridge, under the most grueling conditions, over the River Kwai, linking parts of the Burma-Siam (now Thailand) railway and enabling the Japanese to transport soldiers and supplies through this area. British aircraft bomb the bridge this day to prevent this link between Bangkok and Moulein, Burma. 1946 Nuremberg War Crimes Trials: Former German Foreign Minister and diplomat Von Neurath resumes the stand. "...VON NEURATH: ...I am also perfectly convinced that at that time (mid 1930's) neither Hitler nor his entourage had any aggressive plans, or even considered any aggressive plans, for that would not have been possible without my knowing about it. Rearmament as such involves no threat to peace unless it is decided to use the newly made weapons for purposes other than defense. There was no such decision and no such preparation at that time. The same charge of preparations for aggressive war could be held against all the neighboring states of Germany, who were rearming in precisely... THE PRESIDENT: One moment. Dr. Von Ludinghausen, this is argument, not evidence. DR. VON LUDINGHAUSEN: Mr. President, I must hear how things appeared to him. Decisions for action can only be excused if I explain... THE PRESIDENT: No, we are not prepared to hear argument in the course of evidence. It is evidence for him to say that there were no plans made at that time for offensive action, but it is argument to say that rearmament does not necessarily involve offensive action. We do not desire to hear argument at this stage. DR. VON LUDINGHAUSEN: Yes. Then please answer the question once more, whether there were in fact no plans to use the weapons created by rearmament for any aggressive purposes or for other violent action? VON NEURATH: That is what I just said. I do not believe I need repeat it. DR. VON LUDINGHAUSEN: What reasons were there, what facts, which made the situation of Germany appear particularly perilous? VON NEURATH: At that time Germany could not help feeling she was encircled by her highly armed neighbors. Russia and France had concluded a mutual assistance pact which could only be called a military alliance. It was immediately followed by a similar treaty between Russia and Czechoslovakia. According to her own statements, Russia had increased the peacetime strength of her army by more than half. How strong it actually was could not be ascertained. In France, under the leadership of Petain, efforts were being made to strengthen the Army considerably. Already in 1934 Czechoslovakia had introduced 2-year military service. On 1 March 1935 France issued a new defense law, which also increased the period of military service. This whole development, which had come about in a few months, could only be considered as an immediate threat. Germany could no longer be a defenseless and inactive spectator. 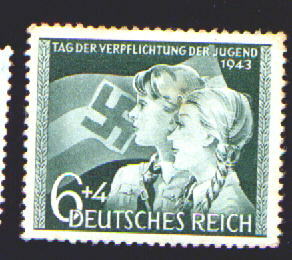 In view of these facts the decision which Hitler then made to reintroduce compulsory military service and gradually to build up an army of 36 divisions was not an act which seriously threatened the neighboring countries bound together by alliances..."
1948 Berlin, Germany now is completely isolated from the outside world. Joseph Stalin, premier of Soviet Russia, who had already cut rail and road access to the city three months earlier, now blocks all ground and water access and cuts electricity to the Western sector. Within a few days, the great Berlin Airlift will begin. US planes will drop up to 13,000 tons of goods per day, for the next 10 months, until Stalin lifts the blockade on 23 May 1949. 1948 The Republican National Convention in Philadelphia nominates New York governor Thomas Dewey. 1949 Cargo airlines are first licensed by the US Civil Aeronautics Board. 1953 Senator John F. Kennedy announces his engagement to Jacqueline Bouvier. 1963 As a step towards independence, Zanzibar achieves internal self-government from Britain. 1963 The first demonstration of a home video recorder takes place at the BBC Studios, London. 1965 A Spaniard in the Works, by John Lennon, is published. 1966 The period of relative peace following WW2 exceedes that following World WW1 on this day. 1968 Resurrection City, a shantytown constructed as part of the Poor People's March on Washington, DC, is closed down. 1968 The deadline for redeeming silver certificate dollars for silver bullion passes. 1970 The US Senate votes overwhelmingly to repeal the spurious Gulf of Tonkin Resolution. 1970 Alexander Dubcek, former leader of Czechoslovakia whose reforms led to the Soviet invasion in 1968, is dismissed from his post as ambassador to Turkey. 1973 Eamon de Valera, the world's oldest statesman, resigns as the president of Ireland at the age of 90. 1977 The IRS reveals that Jimmy Carter paid no taxes in 1976. 1978 The president of the Yemen Arab Republic, Lieutenant Colonel Ahmed Hussein al-Ghashni, is killed by a parcel bomb. 1982 Death: The Equal Rights Amendment. 1983 PLO leader Yasser Arafat is ordered to leave Syria by President Assad. 1985 The wife of exiled, Soviet author Alexander Solzhenitsyn, becomes a US citizen. Natalia Solzhenitsyn celebrates in her new home in Rutland, Vermont. 1986 Guy Hunt is elected the first Republican governor of Alabama in 112 years. 1987 Death: 'The Great One', Jackie Gleason, at the age of 71 at his home in Fort Lauderdale, Florida. 1987 In South Korea, Kim Dae-jung and 300 other dissidents are released after two weeks of unrest in the country. 1989 Zhao Ziyang, who had expressed sympathy with pro-democracy students, is replaced by Jiang Zemin as general secretary of the Communist Party. 1990 US Health and Human Services Secretary Louis Sullivan is mercilessly heckled by jeering demonstrators as he addresses the Sixth International AIDS conference in San Francisco. 1991 On the eve of the 41st anniversary of the start of the Korean War, the US and North Korea agree on returning the remains of missing soldiers. 1992 The US Supreme Court rules that health warnings on cigarette packs don't necessarily exempt tobacco companies from false advertising lawsuits if they continue to tell consumers that smoking is safe. 1993 The FBI arrests eight men in an alleged plot to bomb several sites in New York City. A ninth will be arrested six days later. 1993 Kurdish militants, seeking to call attention to their nine-year struggle to form an independent Kurdish state, attack Turkish diplomatic missions and businesses in more than two-dozen European cities. Hostages are taken and later released in Munich, Germany, and also in Marseille, France. One Kurdish demonstrator is shot to death in Bern, Switzerland. 1994 The European Union and Russia sign a landmark friendship accord in Corfu, Greece. 1999 Testimony ends after 76 days in the landmark Microsoft antitrust trial. 2002 President George W. Bush declares publicly for the first time that the United States will not support a Palestinian state so long as Yassir Arafat is in command. 2002 After considerable difficulty in bringing the various factions together, Afghanistan elects a new cabinet, headed by President Hamid Karzai.